50 miles? Easy. I can run 50 miles with my eyes closed and my legs tied together. How do I know? Because I completed the Thames Trot 50 2016. Not only that but, given the conditions, I didn’t feel like death at the end. Tough race you ask? No, no, no, no, nooooo, no, urm, yes. On any other day, the Thames Trot 50 would be a beautiful amble along the River Thames. A serene 8 hours watching the rowing boats and admiring the beautiful houses on the opposite river bank. A fascinating glimpse of places you would never otherwise go…..like Reading, for example. On any other day you would take time to bask in the beauty of nature as you pass through the fields or marvel at the skill of the engineers who constructed the various locks, weirs and bridges along the route. Richard and I arrived at the Hawkwell House Hotel on Friday evening in eager anticipation of the Thames Trot 50. How hard could it be? Running along a lovely, well maintained, river path. Probably mostly hardpack gravel and perhaps even some tarmac. We can knock this out in a steady 8 hours, easy. Those had been our thoughts in the weeks leading up to the race. The hotel was very pleasant. Happily we had not been given a double bed in our shared room, so no worries there. We pigged out on burger in the very blue restaurant, aptly named the Iffley Blue, got our kit prepared for the morning and got off to sleep. Race registration was in the hotel itself, so no rising at 5am to drive miles. We could amble down for breakfast and make our way to register in good time. There were a good few faces we recognised. Our friend Alex Whearity, wearing his bandana. Paul Ali, who has run this race a million times and Lindley from Challenge Running who was there as support. We had by now begun to realise this was perhaps not going to be quite as straightforward as we had hoped. We had been keeping an eye on the weather forecast and it had been getting worse as the week progressed. Suffice to say that on looking at the forecast this morning the BBC was predicting high winds and heavy rain all day. ALL DAY. Then Lindley kindly informed us that it looked like the course was going to be pretty muddy. That’s no bother. How bad can it be? We ran the Dark Star Marathon the other week and nothing could be as bad as that, so we’re not scared. We had also assumed that navigation would not be an issue until Richard read a blog by a woman who had managed got lost. Surely you just run by the river all the way no? Well, no. In recent years there have been many times the route has been diverted because parts of the Thames Path have been closed to the public. In readiness for this I had downloaded the GPS track to my Garmin so there was slightly less chance of us getting lost. With race registration out of the way, phones and cameras charged and watches locked on to GPS we stood in the driveway of the hotel and listened to the race briefing. Some stuff about wind and rain and mud. Happily the good news was that all of the Thames Path was open so this year there would be no diversions. The obligatory cow caution and litter warning followed and we were on our way. Crucially it was only raining slightly at the start. By the time we had negotiated the tarmac and arrived at the Thames Path and the first of many locks and weirs it was raining more solidly. And then we hit the mud. Forget any ideas we had of running on a beautifully maintained towpath, this was just a grassy, sodden quagmire. Tree roots underfoot and thorny bushes overhanging at eye level made the situation even more hazardous. This was the story of the first 10km. Richard and I had agreed to go out at 5:40 per kilometre and despite the conditions, we did keep to this initially….just about. It wasn’t until later that we heard a number of runners had pulled out of the race at the very first aid station because of the conditions. On a positive note, the rain that had been predicted, turned out not to be quite as bad. It rained most of the day, but it wasn’t heavy and there were enough dry periods for it to be bearable. However, the wind was very much as predicted. It was ok running through wooded areas and thought the towns and villages. But for the first 50km at least, there were a number of very open fields, totally exposed to the elements. With the mud underfoot and the seriously strong headwinds, it made running at anything like pace almost impossible. We were gradually slipping behind our planned pace. The normal procedure for our runs is that the only time Richard and I are together is at the start line. Then Richard shoots off at some crazy pace and from then on it’s a question of whether he can maintain it or whether he tires and I catch him up. However, this time we had actually run the first half of the race together. 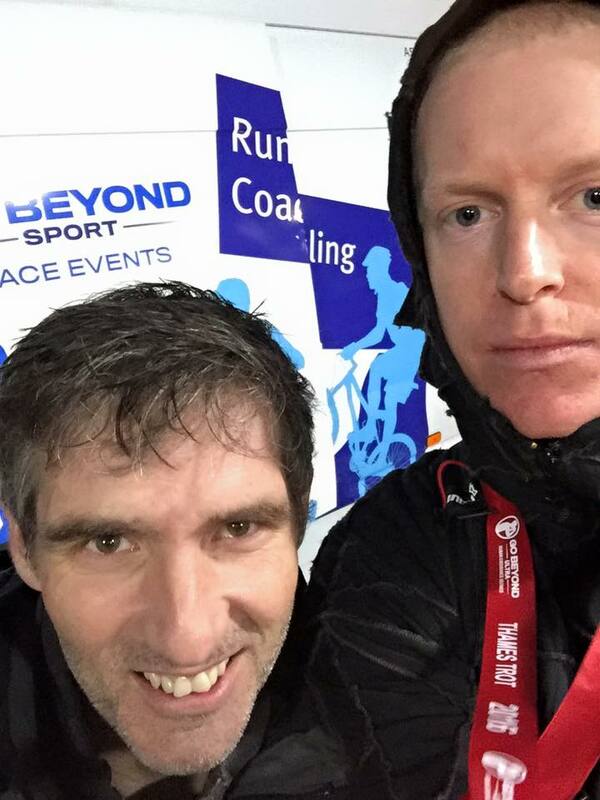 But once we got to the checkpoint at around 44 kilometres Richard stepped it up and I was left behind wondering where he’d gone. He did disappear very quickly and I couldn’t work out whether he had suddenly gone in to 6th gear or whether I had drastically slowed. Probably a bit of both. Anyway, that was that and I plodded on. The terrain was certainly changeable. When running through the towns and villages, as you might expect, the towpath was much more well maintained and much easier to run on. Certainly the long section through Reading was paved and tarmac for quite a way, which allowed me to pick up the pace a bit. We had completed the first half in just over 4 hours, so technically we were still on for an 8 hour finish. But I fully expected to feel it in the second half and to slow significantly. I’m never very good at taking on solid food on long runs. However, I was quite enjoying the odd slice of fruit cake at each of the aid stations. I had my usual baby food pouches and Tailwind in my Solomon Hydration vest backpack thingy. Apart from wishing I had some Coke-a-Cola, this seemed to do me perfectly well. I took on plain water at the aid stations too as Tailwind can get a little unpalatable after 8 hours! Annoyingly after some good sections of pathway, with about 10 miles to go we hit some really bad mud and for around 10km it was a quagmire again. However, by now it was not raining and, because we had turned a corner on the Thames, the wind was now behind us pushing us along. Furthermore, having run 60 or so kilometres the end was definitely in sight so spirits were up. I had been a little confused for sometime about the reading on my watch. See, you naturally assume that if the race is titled the Thames Trot 50, that it is a 50 mile race. 50 miles is around 80km. But the GPS track on my watch said 76km and I wasn’t sure if this was right or if somehow the map wasn’t quite accurate. But at 60km in I chatted to another runner who had done the race before. He informed me that the race is in fact only about 48 miles, not 50. This was a source of great delight to me. I don’t know why because having run that far an extra 2 miles wasn’t going to make much difference, but there we are. We finally escaped the mud and were on a decent towpath as we ran in to Henley-on-Thames. My 8 hour finish time was out the window and if it had been a full 50 miles I would have come in at around 8 and a half hours. As it was I rolled in at 8 hours 13 minutes just before dark. Richard had finished in 7:56 in 25th place. Thanks to a decent run-in, chasing Vet 50 winner Gary Upstone, the final 4 kilometres were my fastest of the race! I was pleased to come 35th out of the 210 finishers. 76 runners retired early. In all honesty, it’s not the worst mud I have run in. Dark Star this year was marginally worse. It’s not the worst rain I have run in. It probably IS the strongest wind I have encountered in a race. But combined the conditions made for one of the most demanding races I have done and finishing in a respectable time is something I am very pleased to have done. Given the number of people who pulled out it was a decent job to finish at all. Our initial plan, thinking the race was 50 miles long, was to aim for an 8 hour finish. Accepting that the race was only 48 miles long we were certainly not too far off our goal. Obviously afterwards you are going to feel it in your legs a bit. But honestly, we could do that again no problem. We have two 100 mile races this year and if we can pace ourselves sensibly I am confident we can not only finish them but finish them in good time. Running 50 miles was no problem, however, getting back to Worthing was the real challenge. We sat in Costa in Henley for half an hour psyching ourselves up for a mammoth train journey involving multiple changes and ultimately various cancellations, a taxi ride and a disappointing vegi bean burger from KFC. It took 4 hours to get home. 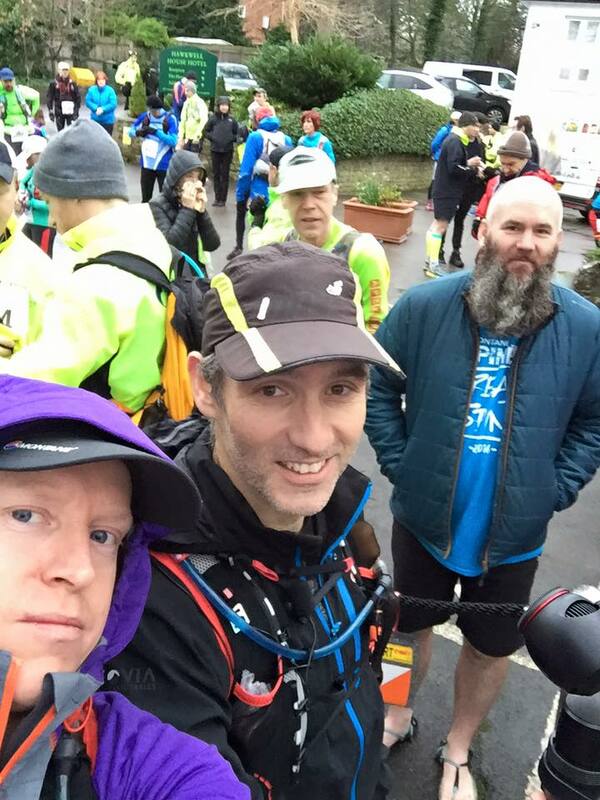 Thanks for taking the time to read my Thames Trot 50 race report. I hope you enjoyed it and the accompanying video. Please give it a ‘like’ and share it with anyone you know who was there or who might like to be there next time. Thanks to all the marshals, organisers and volunteers who stood for hours in that weather handing out drinks, making sure people were safe crossing roads and ferrying those who had dropped out back to the finish in Henley.